The XS part of the l100 Yamaha's title could well stand for excess for the big bike certainly has more than a fair share of power, size and weight. 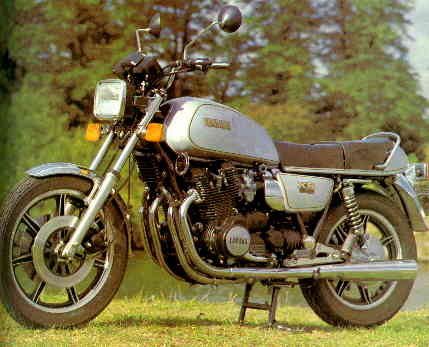 The heart of the bike is a four cylinder twin overhead camshaft unit which has been evolved from Yamaha's first shaft drive machine the XS750 triple. As well as adding the extra cylinders a little more capacity has been added, taking the size up to just under l l02cc. With a 9.2 :1 compression ratio and breathing through four 34mm carburettors, the engine produces an astounding 95bhp at 8000rpm and, even more important for flexibility, 66.51b ft of torque at 6500rpm. The torque curve is remarkably flat and from abound 3000rpm is around the 60lb ft mark, so the engine will pull strongly from slow speed even in high gears. A fuss-free and smooth unit in this case does little to hide the fact that the motor packs a powerful punch. Ride it in anger and it will leave you with few doubts. An average size rider will find the XS1100 a little awe inspiring when first astride the 32in high saddle and will then surely feel a little afraid at the thought of guiding this 564lb monster on the road. The way the big Yamaha rockets away has to be experienced to be believed for suddenly the weight seems to disappear as you lift your feet up and the bike lunges forward. Hold the throttle wide open and the bike will ease its bulk off the front wheel and, even even with the clutch fully engaged, there seems to be precious little stopping the bike from rearing up. Stay down it does, however, as the quarter mile post arrives in just under 12secs and a top speed of 134mph is reached : Fuel consumption at this rate of knots will be a lot less than the 42mph average, though. The bike is let down in two important areas, for the gear change is not that slick and rather ponderous. The complicated linkage of the pedal probably has as much to do with it as the shaft drive. The main deficiency is in the handling department as the bike feels soft and cumbersome in fast bends, inspiring little or no confidence. It probably emphasizes the point that the XS1100 is a super tourer with a lightning turn of straight-line dash, rather than a sports machine. 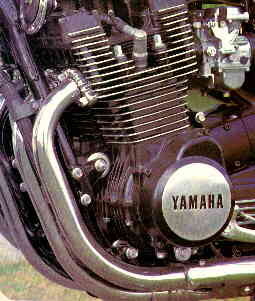 Air-cooled, four-stroke, four cylinder. 71.5mm (2.81in) bore x 68.6mm (2.70in) stroke = 1102 (67.78 cu in). Wet-multi-plate clutch and five speed gearbox. Shaft drive to rear wheel. Front - telescopic fork with springs and dampers, Rear - swinging arm with coil-spring damper units. 3.5in x 19in front - 4.5in x 17in rear.